The likes of Haile Gebreselassie live or die by steps. It certainly is a long and arduous journey from Assela town to New York City. And possibly a treacherous one from here on. Haile’s future is entwined with the fate of Ethiopians. And Ethiopians are unpredictable, depending on where you stand in your politics. Does any one have a record of the mileage on Haile’s soul, on how he feels? Don’t tell me Adidas does; Adidas only sells shoes, in-soles, and socks. Ethiopians are unpredictable and patriotic. And their patriotism often is too demeaning and gets in the way of reaching the goal in view. Recent missteps by Haile are instructive. Haile [uncharacteristically, say some] showered PM Meles with undeserved accolades and, to boot, presented him with the very jersey he wore to break a 10K World Record. Let me say this before we go any further; the place for that jersey is not the prime minister’s drawers but in the national museum. And I am unanimous in this! Well, between the town and the city Haile was able to make a bunch of money. That is, money he could keep and also money he could spend. He is lucky he was not born during the Imperial era. Luckier still his career took off after the reign of Colonel Mengistu ended in flight south to Tergat Land. PM Meles came on the heels of Colonel Mengistu, whatever that means. And Haile never had it so good. He built himself mansions and a business empire and created jobs for hundreds of Ethiopians. For that he is grateful. And so one fine morning the 37-year old athlete decided to make the PM he had known since his -teen years the object of that gratitude. Some say he should not have gotten that close to the PM after the latter deprived Ethiopians of their voice. It could be Haile was ‘asked’ to share the social capital he has been hoarding to help smooth out coarse public opinion; certainly, Haile could have stayed away from entangling himself in local politics. But then he did not; and the rest of us would not! Haile’s statement to retire and then quickly take back his word does tell us something about how he functions. It could be he is susceptible to strong suggestions. Having publicly endorsed the PM it was only later he realized what he had done in terms of bruising his legendary persona in the eyes of the public. Let us remember he took his first baby steps under the shadow of a train of running greats: Abebe Bikila, Bashaye Feleke, Wami Biratu, Mamo Wolde, Wehib Masresha, Shibiru Regassa, Mohammed Kedir, Tolossa Kotu, Yohannes Mohammed, Eshetu Tura, Miruts Yfter, Belayneh Densamo, etc. These have now passed into the annals of distance running on account of the prevailing sense of nationhood and their persevering to represent their country expecting little in return. Could Haile have avoided identifying with the party in power or retracted his statement? Sure. But at what cost? 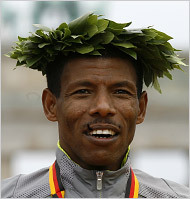 Haile made his international debut in 1992. Nineteen Ninety Two is the year of Great Reversals. Having emerged from a totalitarian state many wondered if Ethiopia was ready to go in a direction that steered clear of old mistakes. In little over a year, alas, Eritrea broke away taking with it Ethiopia’s sea outlet and the country saw divisions along ethnic lines. The significance of the year 1992 is that things could have as easily gone the other way – a mirror image, we might say, of the year 1974. Indeed, there was that possibility. But it did not happen. By and large, we have been running in circles. Right turns have been found to be wrong turns and fraught with pain to last generations considering the decaying moral fabric and rampant social discohesion. Should the next batch of leaders choose the wrong turn [by not allowing foreigners to wield satanic influence over our destiny]? Twenty years later we are hearing once again voices clamoring to reverse choices of days gone by. You see how that fits in with Haile saying one thing one minute and taking it back the next? Can’t you see how he could shower his blessings on PM Meles and a little later have Birtukan Mideksa and her family as guests in his Hawassa Resort Hotel? One for the goose and one for the gander. One for himself and one for the people. Ethiopians are unpredictable but also forgiving. No one now cares to remember the public “outrage” [to borrow PM Meles’s favorite word] against singer Mahmoud Ahmad for appearing in Asmara for a grand celebration that established Eritrea as a new nation. Songs by Mahmoud would have certainly brought memories to president Isaias of his years in Addis as a university student or even in Sahel as a guerilla fighter. Is it not ironic that only a little later Ethiopian music was banned in Eritrea? Could Mahmoud have turned down the invitation when the then Ethiopian president Meles Zenawi played the agent, so to speak, the key-note speaker at and a witness to the historic event? Look around and be flabbergasted by how at present Ethiopians could hardly get enough of Mahmoud. There is no reason why Haile’s case should be viewed differently. As far as the retirement thing is concerned Haile simply did not have the presence of mind to gauge the implications of his decision on a whole line of industry and livelihoods. Another unreported fact is that his mere appearance in New York did cause reverberations within the ranks of the running multitude [in the manner of finds of oldest human remains in Ethiopia on paleontological societies around the world]. I strongly believe his not appearing would have altered NY Marathon 2010 results. For instance, no one paid attention to the Man of the Hour, the little known Gebre [-egziabher] Gebre [-mariam] whose first name “Gebre”, we might add, could be reversed to a surname! In any case, Haile’s handlers, more than himself, did recognize the athlete still has millions of pennies per mile left in his diminutive frame. And they want their share running. Unlike most of us mortals, Haile could go to bed in his Adidas socks and shorts and wake up to find a fat check on his bedside table. Or he could switch to Nike and make a fatter one [depending on the fine print he signed to, which, if need be, could be reversed with the help of another lawyer]. And for this and many more goodies those who depended on Haile would have shamelessly kissed his feet if it took that to convince him to change his mind. It appears they succeeded this time and quite swiftly at that. WARNING: Those toying with the idea of having Haile for president need to think again, not fearing to make a U-turn. It is perfectly legal to change your mind. Don’t be stiff-necked. If Haile did it, you could do it and see for yourselves how good that felt. If, however, you persist in your old ways, at least I have warned you that Haile is highly susceptible to outside influences and could surprise you by getting up one fine morning to announce on ESAT radio that he would not be going to the president’s office because he has better things to do than play emperor without a throne. But then he could change his mind because now the PM owns the prize jersey. Theoretically, Haile could demand the return of that jersey but then he maybe throwing away the chance of becoming president. And that is why I suggest some political animal should squeeze mileage out of “Jersey for the presidency”! Please don’t give me the stale reasoning that sports and politics do not mix until you answer why politicians run for office. The world’s fastest long-distance runners normally train in the Kenyan highlands. Since the outbreak of ethnic unrest in the country, two athletes have been murdered, and many feel threatened. Yet, they remain. And they run — afraid. Kenyan runner Sammy Karanja. The country has some of the best athletes in the world. At 6 a.m. it is cold up here in Iten, a mountain village 2,400 meters (7,874 feet) above sea level in the Kenyan highlands. Thamer Kamal Ali laces up his running shoes and pulls his hood over his head, as if trying to conceal his identity. He is slightly built, 19 years old, hardly more than a child. A hurdler, Ali has several kilometers of road ahead of him today, a route that takes him past roadblocks, burned-out cars and the ruins of houses. The ethnic violence in Kenya reached Iten six weeks ago. Ali is shivering, but not just because of the cold. He is afraid. The catastrophe descended upon Kenya in late December, when it was revealed that President Mwai Kibaki had come to power in a rigged election. Within days, barricades were burning throughout the country and, in Eldoret, people were burning, too. They were members of the Kikuyu ethnic group, which Kibaki belongs to. For five years he has ruled this country. His cabinet is considered one of Africa’s most corrupt, and his associates are notorious for having brazenly filled their pockets and given preferential treatment to members of their own ethnic group — in a country with more than 40 tribes. After the election, members of the Kalenjin tribe set fire to a church in Eldoret. Thirty people, mostly women and children, died in the blaze. Most of the residents of the Rift Valley are members of the Kalenjin tribe. Many Kalenjin, who consider themselves the true masters of the country, feel besieged by members of the Kikuyu tribe who have settled in the region. Many runners also belong to the Kalenjin tribe. Since the fiery death of the 30 Kikuyu in Eldoret, the unofficial death toll in Kenya is 1,000, though the real figure is probably higher. The victims have been hacked to death with machetes, killed with poison-tipped arrows or shot by the police. There are 300,000 internally displaced people. Despite the danger, Ali completes his daily training regimen. A specialist in the 3,000-meter steeplechase, he brought home two gold medals from the 2005 Asian Indoor Games in Bangkok. He is ambitious. He runs at six every morning, shivering and afraid for his life. “Should I tell him: Go home, neglect your profession, drop everything and leave it alone?” asks Ali’s coach, Yobes Ondieki. Discipline, says Ondieki, is the only way to overcome one’s own fear and concerns about one’s family. Ondieki, a former world-class runner, was the first man to run 10,000 meters in less than 27 minutes. That was in Oslo on July 10, 1993. Ondieki is sitting in the restaurant of the Kerio View Hotel drinking a Coca-Cola, facing an enormous glass wall. Perched on a cliff, the restaurant offers a magnificent view over the tops of acacia trees and of the broad valley below. Ondieki looks down. In the grasslands below, bush fires are burning. The milky-white smoke, typical of a bush fire, looks like fog. The smoke from house fires is dark, almost black. Before now, no one in Kenya would have paid much attention to the color of smoke. Ondieki has received anonymous text messages, too, disparaging him for being a Kalenjin — and a murderer. “The country is in ruins,” he says. “There is no longer any security anywhere in Kenya. The police are even shooting at children with live ammunition.” It is virtually impossible for the runners to focus on their training here. Kenya’s national Olympic trials would normally be held soon, and the season of major marathon races in Europe and the United States begins in April. “Giving up,” says Ondieki, “would be the worst thing to do now.” He tries to preserve at least the appearance of normalcy, hoping to keep the runners from becoming discouraged, even as everything else around them falls apart. Kenya is famous for its long-distance runners. Like most of their countrymen and women, the runners have not been able to escape the violence. Here, mourners carry the coffin of runner Lucas Sang, a champion relay runner, who was hacked to death by a machete-wielding mob. In Eldoret, Moses Tanui has barricaded himself into his Hotel Grandpri. The former 10,000-meter world champion has hardly even ventured into the street since the evening of Dec. 31, when his best friend, 400-meter runner Lucas Sang, was murdered. Sang and Tanui were close friends, almost inseparable. They met in London in 1985, shared the same manager and trained together in the highlands. Sang got mixed up in a Kikuyu riot. They hacked him to death with machetes. “Everyone knew Lucas,” says Tanui. 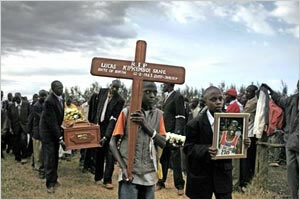 “He was a hero.” Sang and Tanui are members of the Kalenjin tribe, which can be a death sentence in the new Kenya. Tanui is also well-known in Kenya. Tanui also has money. The ethnic violence in the Rift Valley has worsened in the wake of the murder of an opposition politician by a police officer two weeks ago, and there is no end in sight. In a place where public order no longer exists, old scores are settled and long-forgotten rivalries are suddenly reignited. The conflicts get so caught up in each other that you can hardly separate one from the other. Each side has its dead to avenge, and each side fears the revenge of others. This is not an African phenomenon. The situation was no different in the Balkans. The disputes are about clan allegiances. About land. About money. Envy plays a role, too. Where chaos reigns, the underprivileged are quick to turn to violence. There is a vast divide between rich and poor in East Africa.